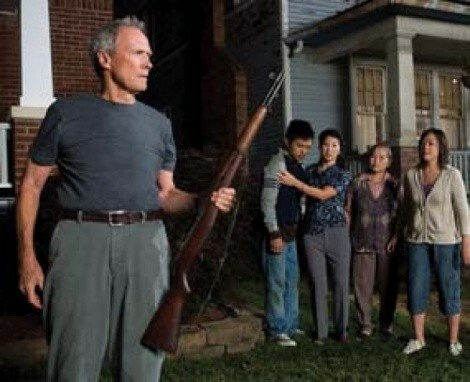 Cinema | Unforgiveable: Clint Eastwood bids a limp farewell to acting in the laughable Gran Torino. But at some point during his cinematic dotage, we all started cutting Eastwood way too much slack. We confused the absence of out-and-out thespianic suckitude in great movies like In the Line of Fire, Unforgiven and Million Dollar Baby for real acting chops. And now, as Eastwood delivers his self-professed farewell performance in Gran Torino, people are lining up to hand him gold statuettes—this despite the fact this may be one of the worst performances ever by a guy who’s turned in a lot of fairly lame ones. We’re off to a rollicking start from the very first scene, in which Walt Kowalski (Eastwood) attends his wife’s funeral. Walt is a flinty, no-nonsense guy, and we know this because when his granddaughter shows up in church in a midriff-baring blouse and sporting a navel ring, he literally growls at her—as in, he squints, curls his lips and goes, “Grrrrrr!” We also know this because Walt’s two grown sons (Brian Haley and Brian Howe) have a convenient conversation in which they explain what a flinty, no-nonsense guy their dad is. In case there’s any confusion over the matter, Walt also begins spouting racial epithets that haven’t been heard since Archie Bunker was exchanging witticisms with Meathead. This blue-collar racism—he’s a retired auto-worker and Korean War veteran living in a Michigan neighborhood that has become pan-racial around him—becomes a defining quality as Walt begins interacting with his Hmong immigrant neighbors. Sue Lor (Ahney Her) is a sassy teen who gives as good as she gets from Walt; her younger brother Thao (Bee Vang) is a shy kid getting hassled by their cousin’s Hmong gang. When Thao reluctantly attempts to fulfill an initiation ritual by stealing Walt’s prized 1972 Gran Torino, Walt catches him in the act, nearly killing them both in the process. You might think this would lead immediately to a call to the police, but you would be mistaken. Instead, it leads ultimately to Thao becoming Walt’s labor-slave, so that Walt can eventually come to respect his work ethic and become a surrogate father-figure to the boy. This places Gran Torino in the time-honored cinematic tradition of relationships between fatherless kids and grouchy old men, in which the mentor imparts valuable life lessons—which may or may not involve the teaching of karate—while also himself learning how to open his heart. None of which is inherently terrible, despite its predictability. But Gran Torino plants this familiar framework in the center of a truly wretched script. Screenwriter Nick Schenk treats the words “spook,” “zipperhead” and “chink” as though they were a priori hilarious, presuming that we must laugh to prove that we understand what a racist—but lovable!—lout Walt is. He introduces the doomed-character cliché of the blood-stained handkerchief. He panders with plenty of exploitation violence, and attempts to turn Walt’s insensitive sons into comic heavies, never once demonstrating enough sympathy to realize that anyone raised by this guy was going to wind up a douchebag. Seeing this script honored with year-end awards has been a mind-boggling experience; if this is what’s held up as a paradigm, no wonder Hollywood screenwriting is such crap. With such a horrible starting point for the characters, maybe the terrible acting should be more forgivable. Eastwood’s young Asian co-stars almost uniformly sound as though they’re reading off of distant cue cards, apparently incapable of investing the words with human emotion. It’s impressive, then, that Eastwood’s performance still manages to look so bad when surrounded by so much carnage. He rasps out his exchanges with everyone in a nearly identical tone, and never seems particularly convincing either as a real bigot or as a reformed bigot. Maybe, being an industry veteran and a knowledgeable director, he decided to fall on the grenade that was this script and make himself look even worse than all the rookies around him. That’d make him a pretty good guy—but it still wouldn’t make him a good actor.